My vacation this year was taken primarily in the kitchen over a hot stove. Pressure canning! Doesn’t sound like a dream vacation does it? It didn’t sound that way to me, but the reality is very far from the experience. 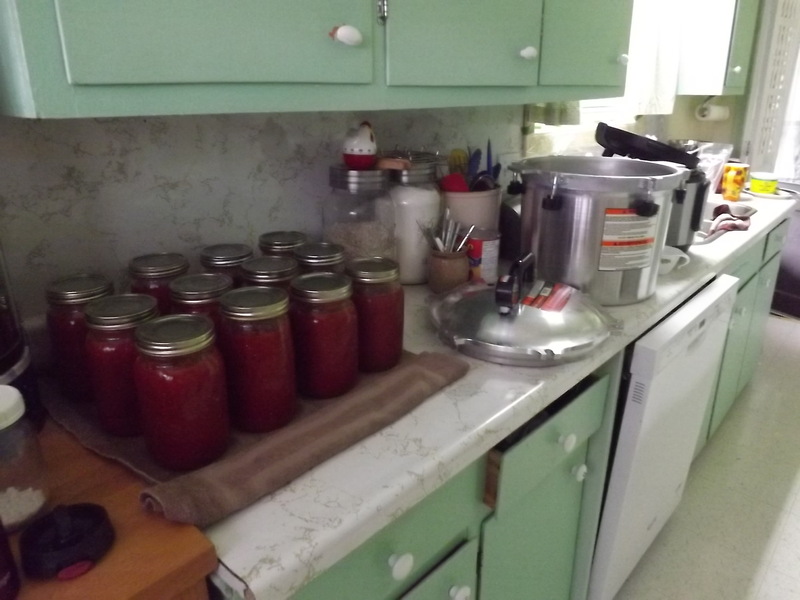 I love canning, I love harvest season, I love spending time in my kitchen, I love good fresh food, and I loved having Attila around and about the place, sometimes helping me, sometimes off puttering in the garden or the garage. Most of all I love to get my teeth into an activity, tackle it, and accomplish a goal. 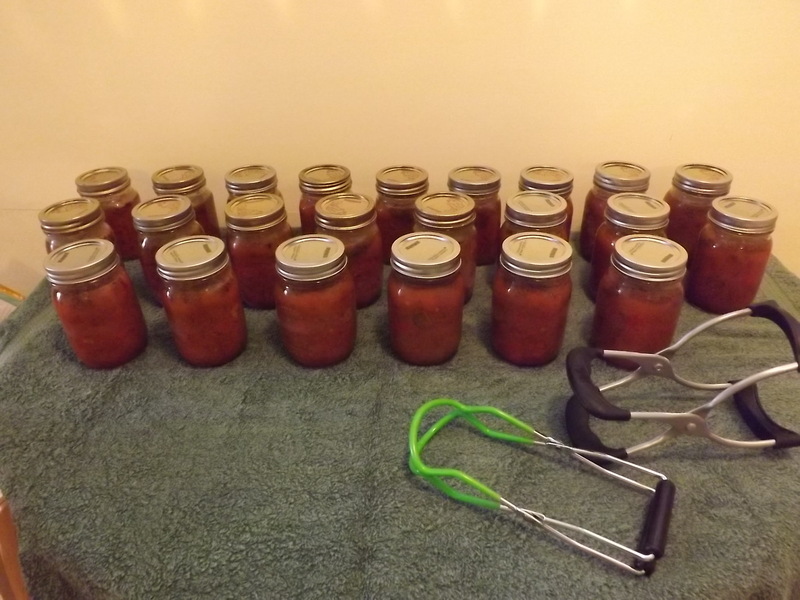 Here are a few pictures of my canning adventure. 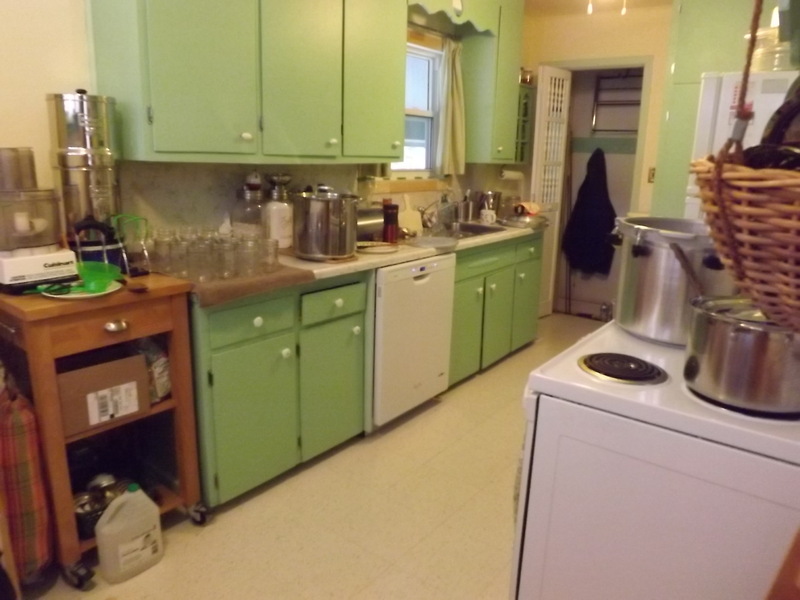 This is the canning assembly line in the kitchen. There were no meals cooked during the canning days, all available space was used for at least 12 hours each day, and usually deep into the night. The first 23 jars of Tomato Red Pepper Sauce cooling on the table. Pressure canned jars need to sit undisturbed for 24 to 48 hours, before moving them into storage. Cooking the tomato puree, in the 16 quart pot. 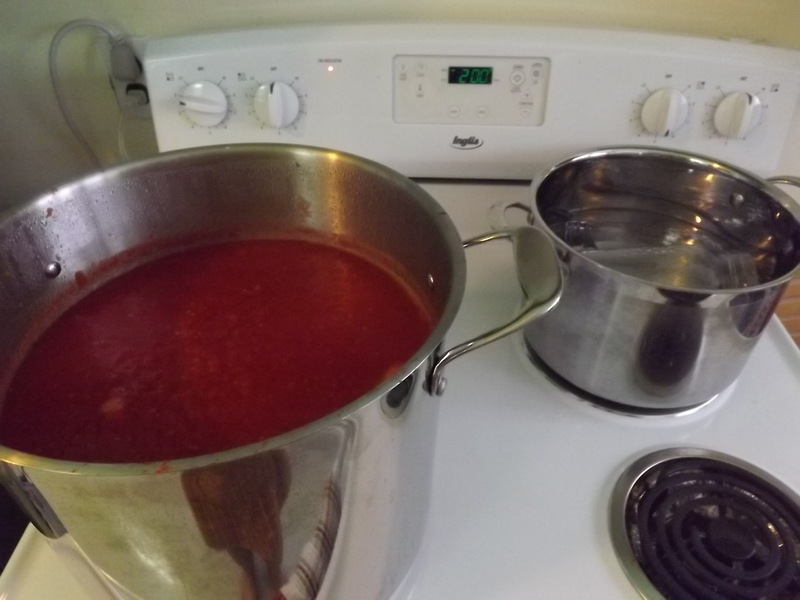 The smaller pot was used for boiling water to sterilize the jars, rings, lids, attachments, for canning. The results of the canning marathon! 12 Litre jars of Tomato Puree. And there is my All American Pressure Canner, resting after all its hard work. 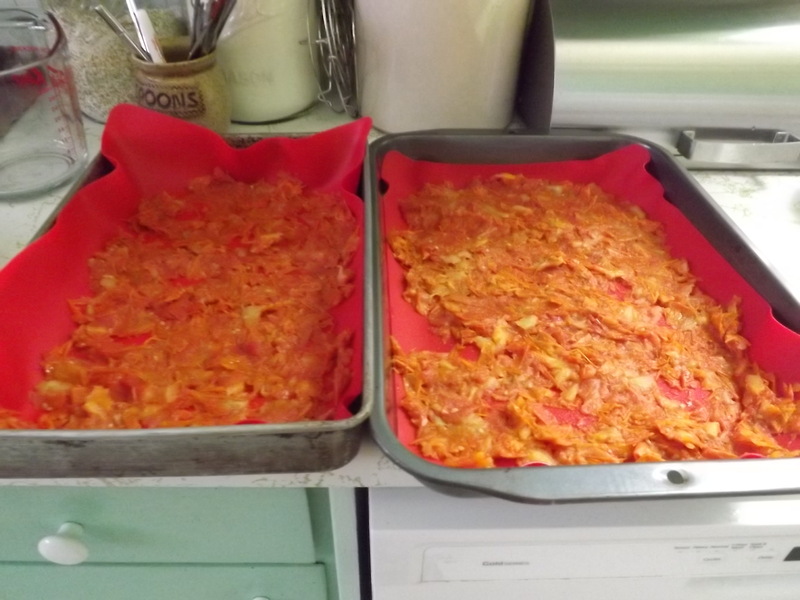 After making tomato puree with the food mill, the skins and seeds were spread on silicon sheets and placed in a 200F oven for an hour or so, this was done several times. The dehydrated tomato skins and seeds. Multiple methods of dehydration were used and can be seen in the layers in the jar. 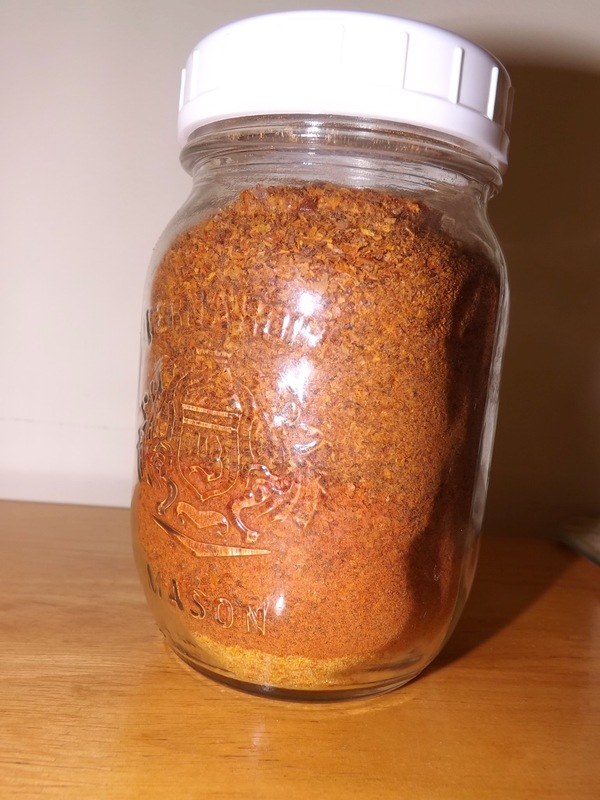 The bottom layer was air-dried, then put in the blender to create the light coloured tomato powder. The middle layer, a little darker in colour, was baked briefly in shallow baking pans, then powdered. The darkest layer, the top layer, was baked on silicon sheets in the oven, then powdered. 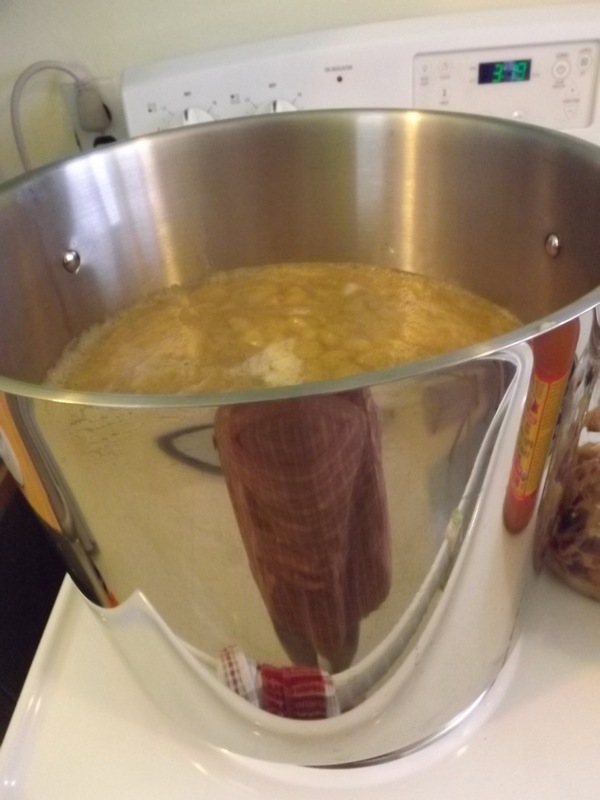 The apple puree in a 15 quart stock pot. The half bushel of apples had the blossom ends and stems cut out, were quartered, boiled till soft, then put through the food mill. 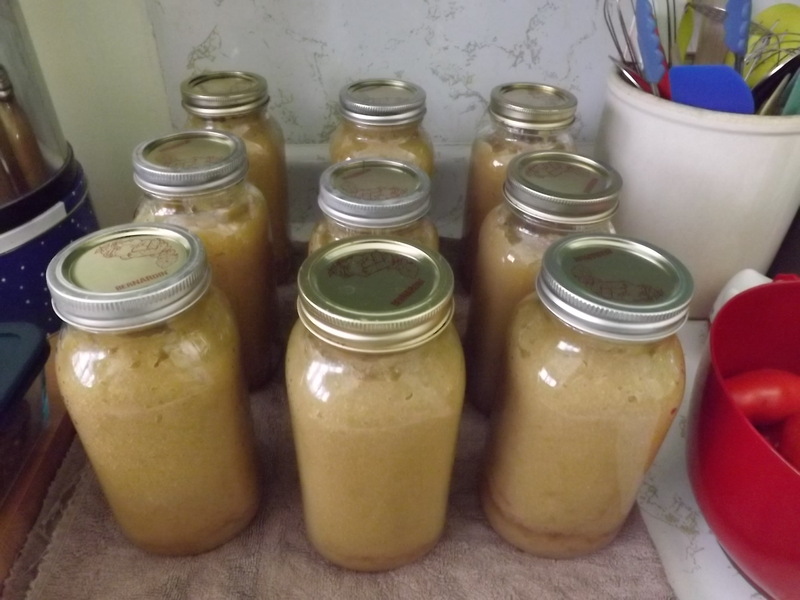 This was a lot of applesauce, and the pot was almost too heavy for me to lift myself. 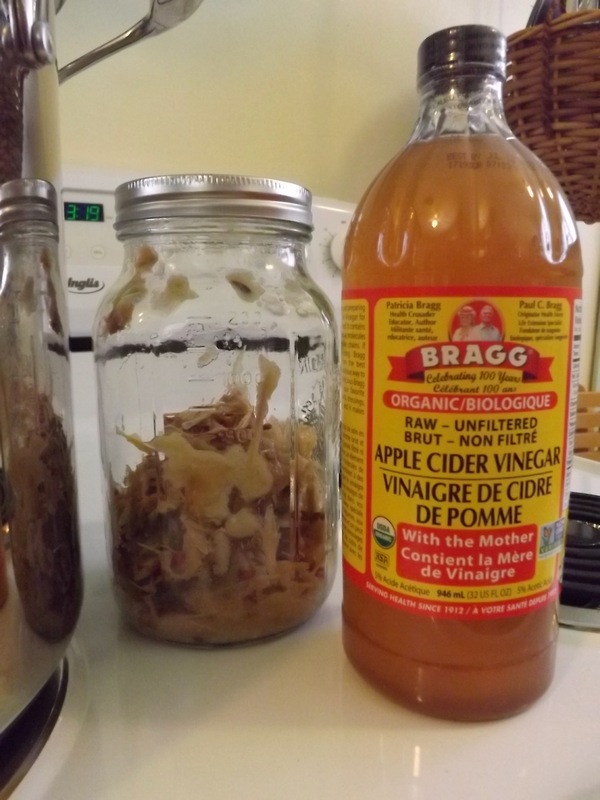 apple cider vinegar, and water to cover all of the skins and seeds, which almost filled the jar. It is sitting a dark cupboard for two weeks now, with a coffee filter covering it, held down by the screw top lid. This may or may not yield apple cider vinegar. The applesauce made from 1/2 bushel of Paulared apples. The jars were pressure canned, and they all sealed as they should. I have been canning for decades. This was one of my first set of canning jars, a Consumers Mason jar. I have only a few of these now. I don’t remember where the others ended up, probably given as gifts, filled with some canned delight. 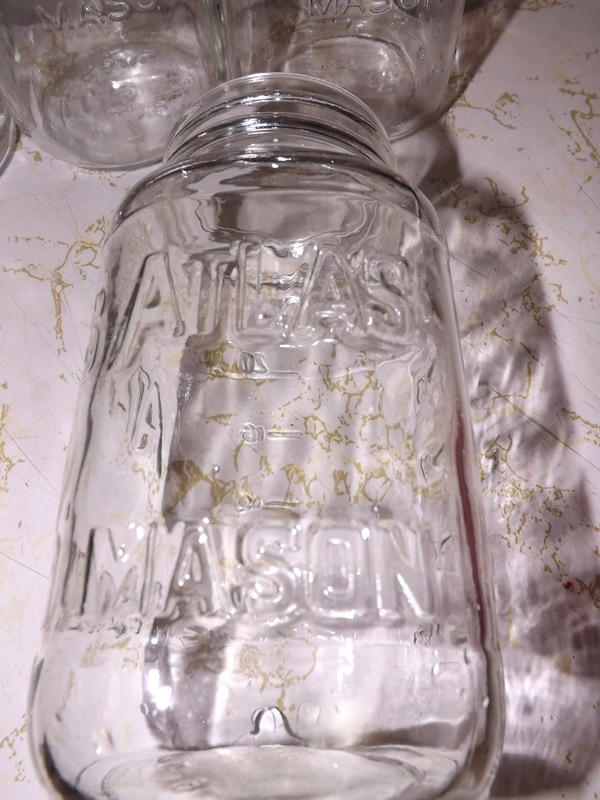 This Atlas mason jar is one I acquired somewhere, no idea where. It is an American Quart, rather than a litre. 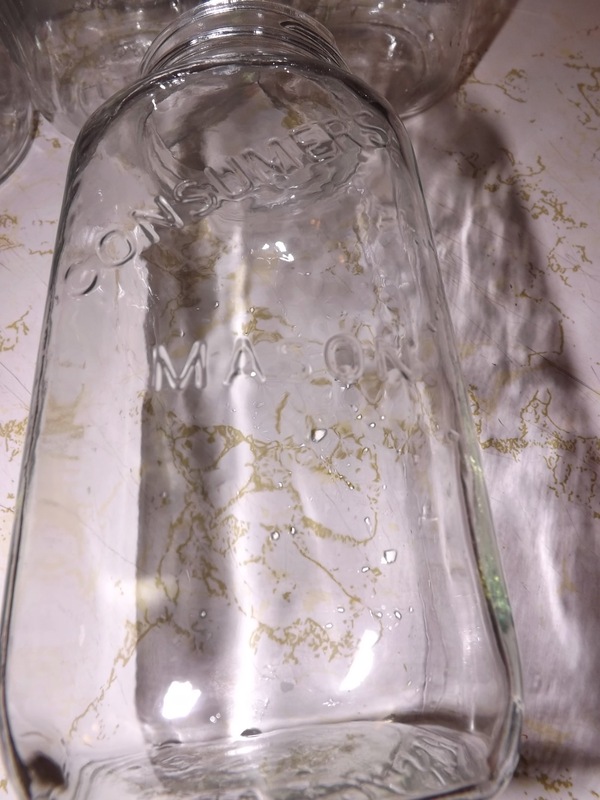 I have five or six of the Douglas Mason jars in my collection. 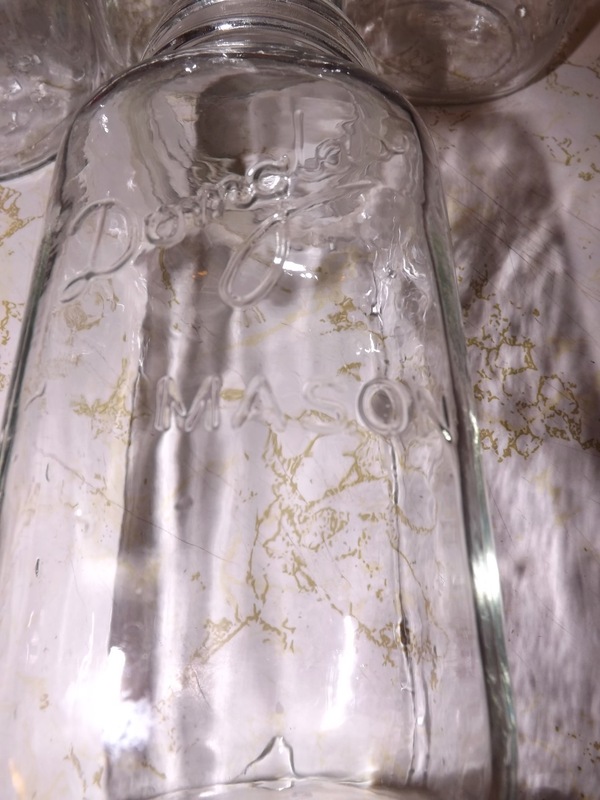 The Dominion Mason jar, I have a few of these as well. 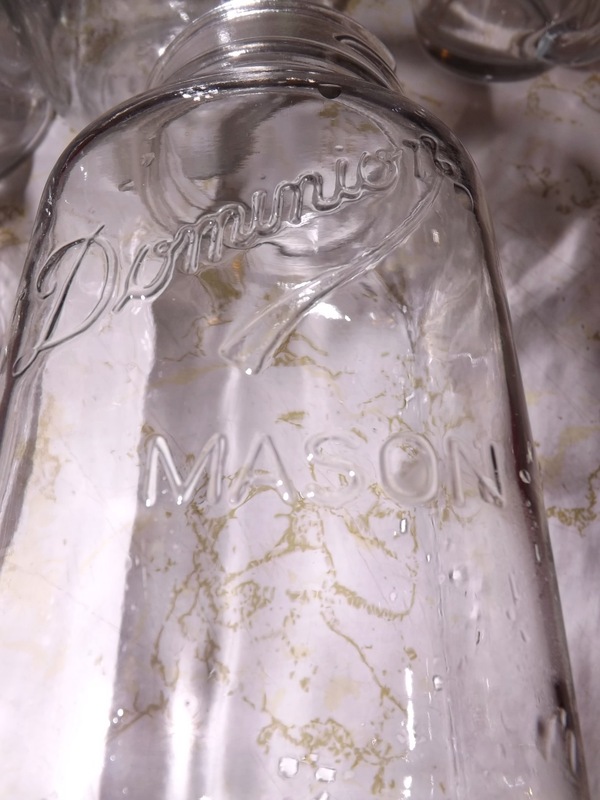 I originally had a dozen each of the Consumers Mason, Douglas Mason, and Dominion Mason jars. I don’t remember ever having broken a jar, so I suspect I gave the missing jars away, filled with food. In the summer of 2018 we grew four varieties of tomatoes. 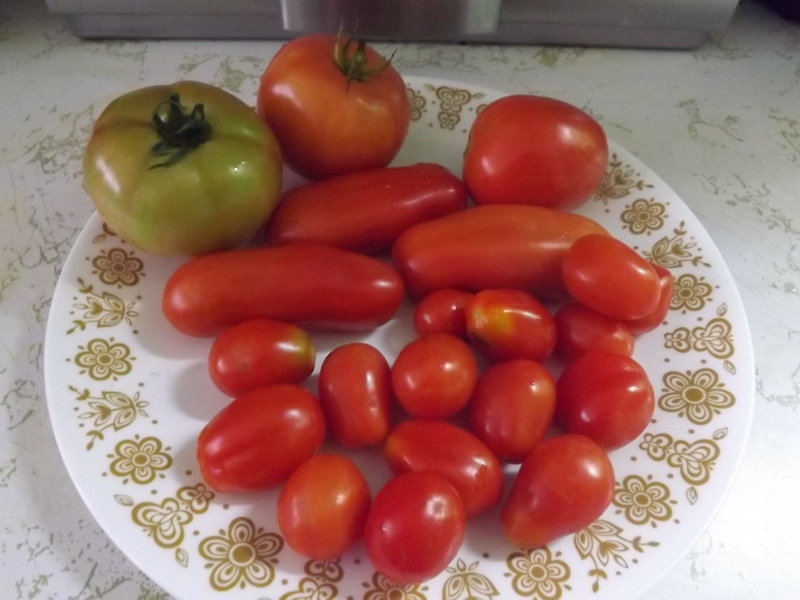 I would not grow the Pink Girl tomatoes again, they were nice but not outstanding and took a long time to ripen. The others were very nice tasting, and were wonderful for canning. And finally, the poor old thing! 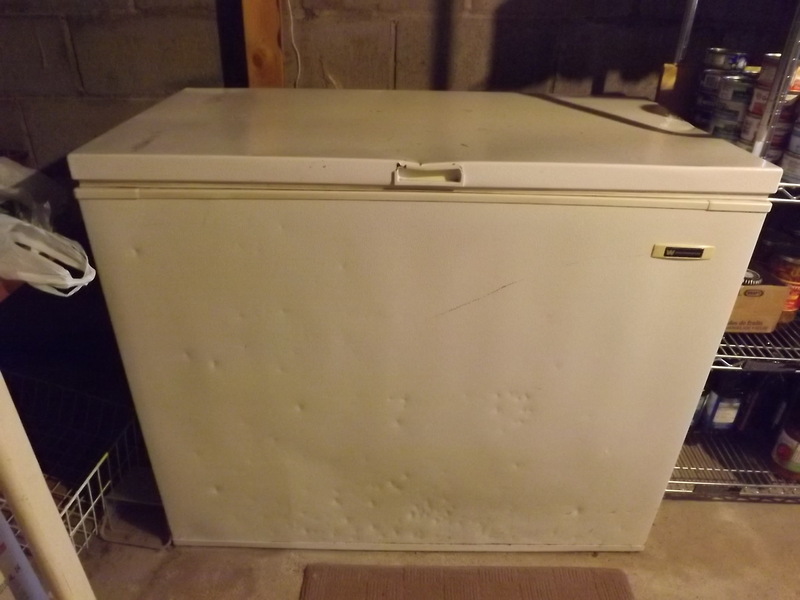 This is the little second hand chest freezer I bought years ago. It was only meant to be a temporary solution to keeping frozen foods at Mist Cottage before we moved here. But when we sold the Country House, the buyers wanted our bigger, new freezer, so we had to let it go. Now this is the main freezer. It is not energy efficient, and it is very beat up, that is why I got if for a song. It works, but it doesn’t provide as much storage as we need. That is why I am canning and not freezing during this harvest season. It was less than a week ago the humidex was hitting 40C! Look at that high today 13C! The weather people say warmer weather is on the way. That will give the garden a chance to yield lots of produce before the first frost hits.